Micron has announced the first product based on their new in-house client NVMe SSD controller. The Micron 2200 doesn't boast performance sufficient to compete with the top enthusiast-class NVMe drives on the retail market, but should be plenty fast enough for OEMs and system integrators to use it as a performance option in the business PCs it is intended for. Micron has been notably slow about bringing NVMe to their client and consumer product lines. They initially planned to launch both client OEM and consumer retail drives built around the combination of their first-generation 32-layer 3D NAND and the Silicon Motion SM2260 controller, but those plans were shelved as it became clear that combination could not deliver high-end performance. 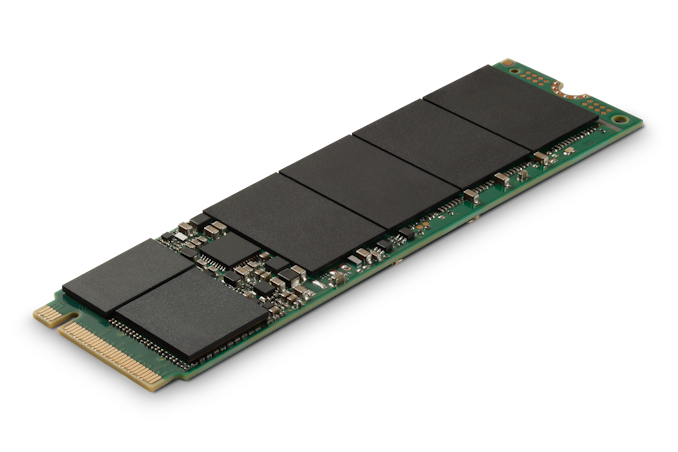 Last fall Micron finally launched the Crucial P1 entry-level NVMe SSD with QLC NAND and the SM2263 controller, but no high-end product has been announced until now. It's been no secret that Micron has been working on their own NVMe SSD controllers. Every other NAND manufacturer has either developed in-house controllers or acquired a controller vendor, and complete vertical integration has worked out extremely well for companies like Samsung. Micron has been the odd man out sourcing all their controllers from third parties like Silicon Motion, Marvell and Microsemi, but their 2015 acquisition of startup controller design firm Tidal Systems made their intentions clear. That acquisition and any other in-house controller design efforts bore no visible fruit until Flash Memory Summit last year, when a prototype M.2 client NVMe SSD was quietly included in their exhibits. Micron has not yet shared details about their new NVMe controller, but the basic specs for the 2200 SSD are available. The 2200 uses Micron's 64-layer 3D TLC NAND flash memory and offers drive capacities from 256GB to 1TB as single-sided M.2 modules. The drive uses a PCIe gen 3 x4 interface and has the expected features for a Micron client drive, including power loss protection for data at rest and SKUs with or without TCG Opal self-encrypting drive (SED) capabilities. The performance and write endurance ratings for the Micron 2200 don't match up well against top consumer drives, but compare favorably against entry-level NVMe SSDs. Endurance is actually lower than their Crucial MX500 mainstream consumer SATA drive, so any retail derivative of the 2200 will need to improve on that metric. No such retail version has been announced, but with the 2200 available now it is likely we'll be hearing from Crucial within a few months, though they may wait until later in the year to launch with 96 layer NAND instead of 64 layer. "For most users, there is only one NVMe slot - normally occupied by the OS disk. If additional local storage is wanted then SATA is usually the only possibility. " -- no, quite the opposite is true.